Welcome to Lowered Expectations, week 26 edition! Each week, we go about posting chalkboards and GIFs of the weekend’s best open-play shot attempts which did not quite live up to expectations (and rarely do we update this paragraph). We look at each one and not only evaluate the results, but also the process leading to them. Shots at this range that don’t end up on target make me incredibly frustrated. Not because they should all be on target but I’m a firm believer in making the keeper prevent you from making a goal rather than you trying to get it past the keeper. Odds are, the closer you get to goal, the easier it is to put the shot on target and the more likely they are to make a mistake than save the shot. Don’t misunderstand. I’m not talking specifically about scoring. Scoring is another matter and it isn’t always solely dependent upon the attacker’s striking of the ball. In fact, a majority of the time the ball is on frame, the keeper specific details are a much bigger factor. Arm span, jump, reaction, and positioning all matter as much as the shot, if not more. Considering Daniel Royer took an extra touch I’d guess the probability of him putting this shot on goal should be near 70-80% and instead he skies the ball over Bill Hamid and his goal. I love Royer and I really appreciate what he brings to the Red Bulls, but moments like these tend to unfairly overshadow his contributions. Two quick things; that pass by Derek Etienne is a delight and that dummy from Marc Rzatkowski is brilliant. Red Bulls can play some ugly soccer at times. This was not that... well, except for the shot. Lord that shot was awful. This whole play is just so hard to dissect and just has a lot happening immediately following the Orlando goal and Atlanta kick-off. It looks super obvious at first but then you pull a thread and things start to kind of unravel. What was this defensive marking shift between Carlos Ascues and Shane O’Neil? Ezequiel Barco makes his way easily past Ascues and O’Neil steps up to him but vacates a pocket of space on the back line. But does that even matter to the play? Would O’Neil have gotten to the ball played to Hector Villalba from Barco? What about the pass from Villalba to Josef Martinez? How about that control by Barco coming across the field? That’s pretty good. Or at least it looks that way. Ascues doesn’t really make an attempt and it makes Barco look a bit better. Or maybe he doesn’t have the foot speed, realizes it and makes a better decision to help protect the back line? Did Jonathan Spector make a mistake trying to push the offside line? He seems to create separation between himself and Martinez by trying to keep the line and reads the play late. Should he have stuck with Martinez through the offside line? I’m honestly not sure what he should have done better. Because Spector is late to the ball he comes barreling in on Martinez who looks to be in on goal but... does he even touch Martinez? I’ve watched this play like fifty times and I honestly can’t tell and I’m super surprised this play wasn’t reviewed. If Spector doesn’t touch Martinez how does Martinez ... I guess, trip? Both of Martinez feet seem to be caught on the grass but obviously touch the ball and direct it out of bounds. If Spector doesn’t touch Martinez, it would seem the angle and delivery of the pass just skewed Martinez in the end. Which is... surprising. This whole thing is just kind of a mess and it’s pretty unbelievable that it all came off a kick-off. David Villa at 36 still impresses me every game. The dude is always just 100% committed and his run to save this ball from going out of bounds AND THEN with the move to create space for a perfect (*mutters* cross *cough* *cough* *cough*) in to Rodney Wallace who is unmarked on the back post. He’s brilliant. That sequence is what makes him one of the most valuable attackers in MLS. Clint Dempsey retired this week and it’s sad to see these legends leave the game. Don’t let another go without you appreciating what they do. Also, what on earth is that #NinjaKick? It’s awful. How is that better than what Jonathan Lewis could do? I mean, go back to the initial pass by Wallace which wasn’t very good to begin with but his redirection on this shot is simply awful. He’s right in front of goal mouth and it’s not even close. It blows my mind. Put in Jonathan Lewis! Is there a hashtag yet? There should be a hashtag. Someone put up the bat signal for @Dummy Run. I’m gonna need a hashtag. I don’t really understand or fathom what happened here. 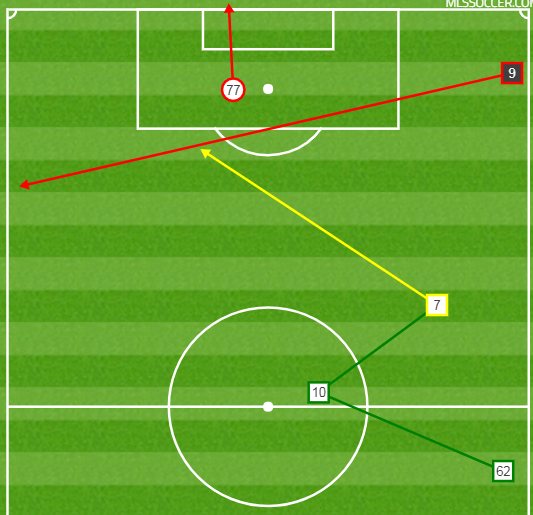 It’s a great pass by Andreas Ivan who picks out the perfect time to send the pass in to Bradley Wright-Phillips and--it’s almost like a glitch, like in FIFA or something. I almost missed it pining over this miss. That trap and pass by BWP at the beginning of this clip. Watch it carefully. He stops the ball almost on a dime with two defenders right there and that off shifts the ball to Ivan running wide.... *expletive*. How does he miss that shot? I seriously do not get it. First and foremost, it’s super good to see Michael de Leeuw back on the field. His injury really hasn’t been talked about enough. He’s an interesting attacking tweener that isn’t going to be a devastating figure on his own but he can create moments (like this one) and can help take some of the pressure off Nemanja Nikolic. de Leeuw’s run off the ball and into the middle of the box is nearly perfect and if Nikolic delivers a better pass maybe this is a goal. The otherside of that however is the attempt by de Leeuw to steer the shot on target seems, at least by my eye, really kind of sloppy. I think considering the slide attempt and the ball coming high, plus he’s still working off the rust we can give him a pass. One other take away from this is Chicago homegrown Djordje Mihailovic. He’s kind of quietly very good and I don’t want you to miss the subtle of it. His pass to Brandt Bronico is predicated upon a quick turn of his hips, and his head to check where everyone is, which gets the defender, Wil Trapp, to bite and creates space for an inside pass. It’s not just good for a 19-year old, it’s just simply really good. Add to the fact that he is only 19 and while he’s not necessarily been part of the recent USYNT hype train, he has spent time with the US-U19 team and could be one to watch going forward. I really hope Chicago, being at the bottom of the table (on ppg) and still with another seven games left, will continue to play the youngster. Please play your kids, folks. My immediate reaction to this is build-up is I can’t believe that pass came from Michael Bradley. Like, it’s not good. And I really mean so not good---not at all. Most of this play falls into place due to Montreal’s bumbling defense. The slip pass by Justin Morrow gives Sebastian Giovinco just enough of an opportunity to win the ball and then take a shot with no defenders in front of him which increases the probability significantly. The lack of defenders is a huge deal. The vast majority of chances which are taken from the spot Giovinco took his from are done so with multiple defenders between the shooter and the keeper. This means implies the attacking team is working in a congested area and on top of creating space for the shot, they’re dealing with a small window in which the shot must be taken to even be on target, let a lone score a goal. But in this instance Giovinco wins the ball and is quickly into the box. He’s already created space for the shot and even has created separation between him and and the defender. Because of this he has a much larger goal mouth than what is normally afforded him. The cheeky chip over Evan Bush’s left shoulder finishes the move beautifully. But while the chance is significantly increased it’s still not “a gimmie”. Remember this shot is converted roughly ~4% of the time in congestion. You still have a keeper with a good angle and you can easily argue that Bush should have saved it. You also have the times that Seba pushes it just wide rather than picture perfect. While it might not seem much, in this context, a significant increase is maybe only up to 20% or 30%. Real fast, let’s come back to that pass by Bradley. I’’m not a “Michael Bradley’s 2017 season was the greatest ever and should have been the MVP” truther. Though I will easily concede he was the best player on the field during the 2017 MLS Cup Final. But somewhere between that game and the CONCACAF Champions League final, he’s take his game down multiple notches. The eye test seems to say he’s lost a step, he’s not comfortable tactically and he’s more error prone than at any point in any MLS season before. Simply put, Bradley’s best games are when he’s shuttling attackers outside, protecting the ball from turnovers inside the defensive half and playing line splitting balls. Which is to say exactly the opposite of the way he’s been playing. But even at 31, I’m not convinced that he’s “done” just yet... There is a case that he’s still capable starting midfielder. Expected Buildup (see table below) provides us with a bit more insight to see what he does as the metronome for Toronto. Without even comparing him to others at his position we can see that he’s been really good comparatively to previous season, even when you take into account the fact that some of those minutes have come as a centerback. The Expected Passing chart still has confidence in him too. Again, I believe he’s an above average player still. All the numbers indicate he’s still able to be what he was last year and I think he can still be a difference maker for some team. But I honestly wonder if that team is or even could still be Toronto. I really wonder if any other team would be interested in chatting with Toronto about him. And vice versa I really wonder if Toronto has any reason to say no at this point.